Northampton Saints and England flanker Tom Wood admits he is still some way short from being at peak fitness. The 25-year-old has played three matches for Saints this season after a foot injury restricted him to just 14 starts last season. It also ruined his chances of representing England in the 2012 Six Nations and on tour in South Africa. Wood told BBC Look East: "I'm not fully fit by a long way and I'm still 10-15% off my best." He added: "I've had to use these games as fitness training and it's taken a while to get going, but hopefully I'm getting close now." 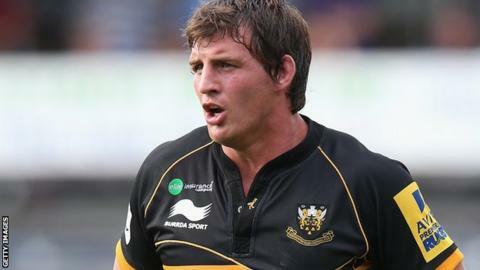 The former Worcester player has won nine international caps and still hopes to be in Stuart Lancaster's plans for the autumn internationals and beyond. "There might be a chance [of selection for the autumn internationals]," said Wood. "I need to walk before I can run, but if I'm fully fit, I'll be in a position to be in contention. "I think I'm still in their thoughts and, if I get back to my best, I won't be too far away. "But it all comes from playing well and being part of a good Saints' squad. There's a lot of competition for places here before I worry about England."